Skinny Minnie is on the right and Ruby on the left. See no tail feathers. Skinny Minnie managed to escape back into the garden again , the commotion prompted Bailey to chase the other two, pandemonium ruled managed to get Bailey out, now by this time the cat was stalking skinny Minnie who again managed to get in under all the shrubs and nettles, brambles etc. Dogs were barking, chickens were squawking I was shouting. Managed to get the dogs in the house, went looking for skinny Minnie poor thing has lost all her tail feathers, I picked her up and cuddled her she chattered away, her wattle and comb were quite pale . I just quietly sat with her on my lap holding her and stroking her feathers till she calmed down a little I then, put her in the coop and she settled down. contacted the girl I got the hens from and she said to give her pro biotic yoghurt and to check her for cuts. So had to go into town at 8pm and look for probiotic yogurt, couldn't find any. In all three supermarkets no probiotic yogurts, don't they know this is good for a stressed hen and I had a stressed hen. 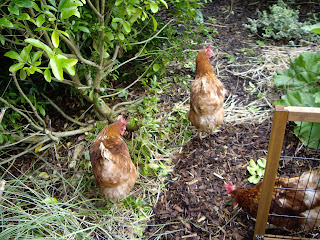 Came home and lifted skinny Minnie out of the coop and of course she has cuts all over the place, contact Mama Hen again and another friend who keeps chickens, mama Hen told me to bathe the wounds and put antiseptic cream and cornflour on the wound and to separate her from the other hens,( what!!) asked her to clarify, meanwhile my friend suggested covering the wound, so I bathed her wounds with salted water, dried them to stop the other chooks from pecking the wound. Though I must say they are very good they leave her alone. (She is the loner though) stuck an antiseptic wound dressing on it! My friend also suggested that the chicken could well be dead in the morning as it will have gone into shock. Went to bed at 2 am trying to figure out what I can do now to stop her getting through the fence, the other two are two plump, she is thinner. 3 am online ordered windbreak wire mesh to cover the fence from Amazon.. 3.30 am put a bid on ebay for a 16 section puppy crate each section is 3 ft x 2 ft .
Another sleepless night and dreading the morning. Collected 3 chickens yesterday from the chicken rescue place in Moira (The Nut House) came home settled them in gave them the run of the garden , they were eating everything in site, clematis gone at the roots, rhubarb leaves slugs peck peck chuckle chuckle. I went online as I was told rhubarb leaves are poisonous to hens, so out I went and deleafed all my rhubarb!!! At 7 o'clock I made some mash potato and sweetcorn one is a little skittish and isn't so friendly keeps her distance but managed to get her and she had a share as well. Eight oclock I thought I should be thinking of getting them in and I wonder if anyone has laid an egg yet. went out and Tiffany and Ruby come running to meet me, chuckle chuckle peck at toes. Looked round no Skinny Minnie at 8.30 I thought this is really strange I don't hear skinny Minnie so hunted the garden, then hunted the garden for feathers not a feather in sight, (as there are feral cats and foxes around), then hunted the garden for a body. No body. OMG what am I to tell Mama Hen the lady I got the hens from. She will think I am totally irresponsible, that something got one of the chooks!!! So gathered up the remaining two and put them in the coop for the night. They are really easy to handle , no trouble at all . Went off into the yard and barns below no Skinny Minnie, hunted the trees incase she was roosting no sound no nothing. Every half hour I was out looking for her. Sent the dogs in to see if they could flush her out, nothing. Went to bed at 2 o'clock worried sick about this poor hen, feeling useless that I couldn't find her I had thought they were totally safe, garden was enclosed, gates are all shut etc. didn't sleep as by now all I am worrying about is keeping the remaining two safe. At 6am let the cat out and dogs out, checked the coop it's still there and locked up and nothing is getting out till later. At 8 o'clock I let Tiffany and Ruby into their coop that has a small run attached and decide they aren't getting any further until I have walked the dogs as so help me whatever took skinny Minnie will be so dead. Mentally preparing myself to find a dead chicken on the walk I headed off. Walk out the gate and running up towards me is Skinny Minnie. I throw the dogs back in the yard, and this is where the real pantomime starts, as I run down shouting chook chook chook, towards her, she changes her mind and runs the other way making an almighty din. So done the road I go making a wide berth and manage to get in front of her and she turns and heads back towards the house, always just out of reach, every time I bend down to pick her up , her pace quickens, all the time chattering away. Bother I forgot the dogs are loose in the front so clever me takes my coat of and decide to throw it over her. Well the coat flutters in the air she squawks like a demon possessed and takes of zig zagging all over the place back the way we had come. Another attempted coat throw and that idea is aborted as by now she is deep in undergrowth consisting of brambles, nettles and whatever else is in there. Eventually she gets stuck in tree branches and I get her. She is so grounded. But first I have to find out how and where she got out as I thought it was all chicken proof. such relief and all for a chicken I have only known a few hours. You will need the circle cut ruler and cutter, I got mine at the Missouri Star Quilt Company this is also where this tutorial is from. I used a spot of glue to hold both in place, then take to the sewing machine and stitch ¼” seam allowance, leave the edge raw, no turning in needed!! Then simply join the squares, I trimmed the background from the square with no centre, to leave just one layer to stitch through. 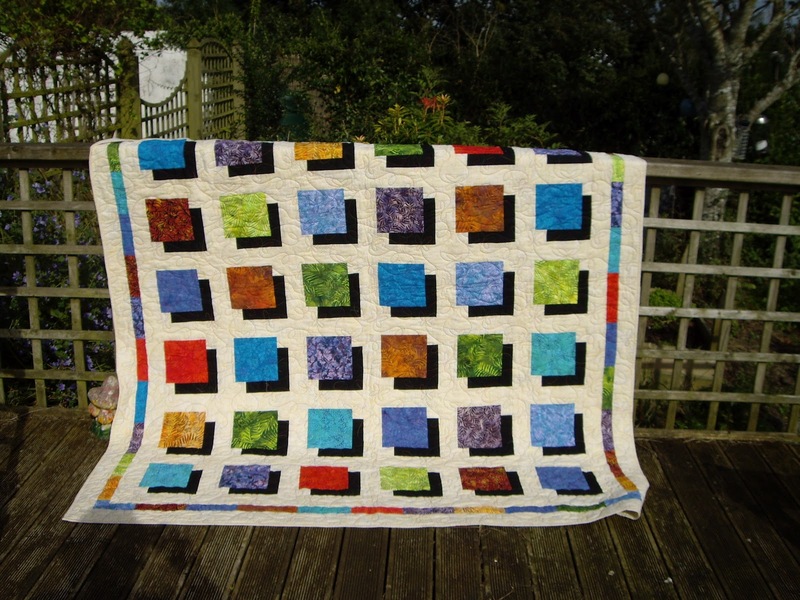 In no time you have a quilt like this. With hindsight I would have cut the squares for the piece with the hole in it smaller to save the trimming. Now all I have to do is decide if I shall add a border or not. I think it looks fine without I will quilt just the white parts. This reminds me of the bullseye quilt from an online swap I took part in many years ago with the Quilting Sisters group. I am sure its on my blog somewhere. Looking at this now on the wall I am thinking each block could have been cut in half again and rejoined with an opposite (postitive and negative in the one block). Must try a sample and see what it looks like. Thought Id give this a go and see how quick it really is, and it is! For this I started with 5" squares. This is done in pairs so join two squares by stitching along two opposite sides. Repeat this for as many patches as you want, it can be done in two colours or real scrappy like my example. Then take your ruler, measure from the edge of the fabric NOT the stitch line and cut at 2 1/2"
Hey presto a pile of four patches in no time . The first is a disappearing four patch, so easy to do and makes a lovely cot quilt, Might do this in browns and buttermilk yellow . Then nothing was stopping me by this time I pulled out a box and found an old and I mean old pattern from a patchwork and quilting magazine years ago and using my acuquilt rustled up this little Suffolk puff topiary tree in no time. Out came the acuquilt again and this is the result of that. 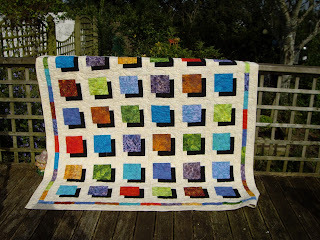 Now I am off to try a couple of more tutorials from the Missouri star quilt co , my onlu problem is I am finishing nothing I have a pile of quilts to now quilt! Last Saturday a group of ladies from my class in Swatragh went on a 'shop hop'. We left Magehra at 8 am on a bus and headed for Quilters Quest in Belfast. Here Yvonne had laid on tea/ coffee and scones when we arrived. we were show some beautiful quilts including a cuyrved rail fence, I must try this. Some ladies had a go on the long armer and I collected this quilt which Yvonne quilted for me. and yes we all bought fabric! we left with purchases goodie bags and much chattering. Next stop was lunch, soup and sandwiches in Carrick and there we went to Craft Womans World it was slightly disappointing as they charge more for cut pieces than what is on the roll. Won't go back there again. Then back in the bus and off to Ballyclare to Karen in Fiddlesticks. Here more tea coffee and cup cakes and shortbread to die for. Yes we spent more money and another goodie bag. Here Karen demonstrated her Acquilt and many ladies purchased fabric that Karen then cut into various pieces for them. Would you beleive it by this time it was tea time and we all headed back into the bus and ff for an evening meal in Templepatrick. Arriving home at 9 pm I just about managed to unpack the purchases walk the dogs and fall into bed.